The Black Mamba Disposable Nitrile Gloves BX-BMG have become renowned in the hand safety market due to their specialist properties which have made them an industry favourite. Ranging from the oil to chemical industry, the Black Mamba Disposable Nitrile Gloves BX-BMG have proven to be a reliable glove that people trust. This reliance is in part due to the superior strength and tear resistance of the gloves which allow the user to rest assured that they are using one of the toughest gloves on the market. Alongside the protection from tearing is the chemical resistance of the Black Mamba Disposable Nitrile Gloves BX-BMG which has made them very popular within scientific institutions, the gloves are resistant to a wide range of chemicals and the list of chemicals can be found below. The Black Mamba Gloves are available in sizes ranging from S to XXXL. Through this listing, you can purchase the Black Mamba Disposable Nitrile Gloves BX-BMG in bulk quantity, getting 5000 gloves at a discounted price. Ideal for businesses of every size, this Bulk Pack allows you to save money on your essentials. To buy this product in single boxes and for further information, please see the standard listing. Grip Rite - The Black Mamba Gloves are fully textured with Grip Rite finish, this means the gloves provide the precise contact when tactile sensitivity is a must. 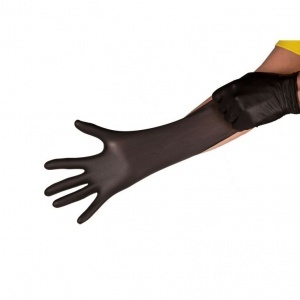 Chemical Protection - Unlike many standard nitrile gloves, the Black Mamba Gloves provide three times the chemical resistance of standard latex and vinyl gloves. Two-Ply Fusion Strength - The unique process fuses an added polymer to facilitate donning and comfort. Patented NITREX Polymer - This specific property enables the Black Mamba Gloves to achieve superior strength and tear resistance. The 'Black Mamba Disposable Nitrile Gloves BX-BMG' are available in six different sizes as shown below. Please measure the width of your hand through measuring your palm from one end to the other excluding the thumb and fingers. Usually the best point to do this is above the thumb region but before the start of your fingers in order to achieve an accurate measurement. Below is the sizing guide.